Cloud Nurdz Peach Blue Razz is an awesome candied vape with the unique combination of sweet summer peach and tangy Blue Razz for a sublime vaping experience unlike any other. Get ready for a full on fruit candy vaping experience that is as nostalgic as it is delicious. 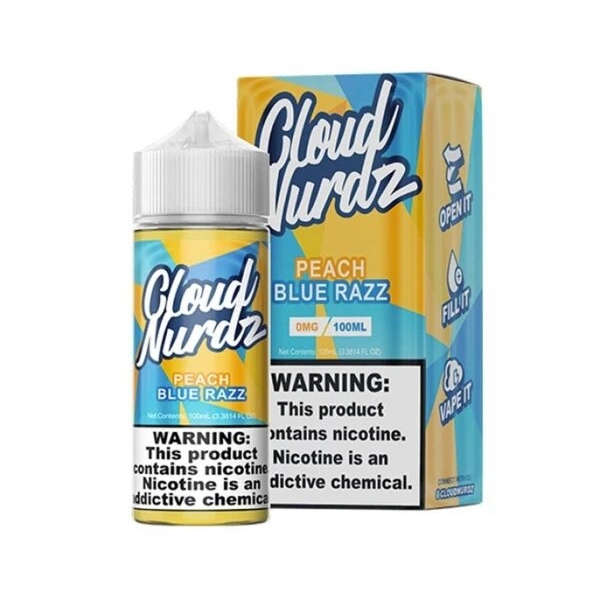 Cloud Nurdz Peach Blue Razz as a light fruity candy taste. Sweet, but not heavy handed and has the perfect blend of tart that will bring a smile to your face every time you inhale. Treat yourself to this tasty and satisfying vaping experience in100ml bottles today! So far I really like this juice and I love the convenience of ordering online! That you guys started carrying this brand all are great but this one and strawberry lemonade is where it's at!